﻿Benefits: Cleansing of skin and bringing a healthy glow to the face. Suitable for normal to oily skin. 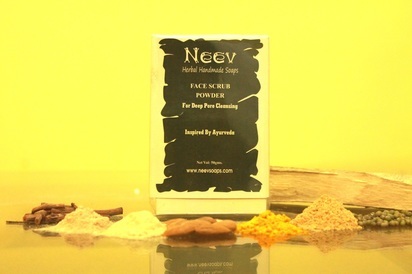 Ingredients: Refreshing mix of pure Sandalwood powder, Fuller's Earth (Multani Mitti) and Camphor. ﻿﻿﻿ Benefits : Green Gram softens the skin and empties the pores, Neem removes acne and pimple, and skin scars; turmeric removes skin allergies and brings glow, and checks facial hair growth; manjishtha reduces pigmentation, sandalwood is a natural coolant and removes scars, khadira is skin detoxifying, almond is rich in Vitamin E.
Benefits : Helps Maintain skins pH balance, natural cleanser, hydrates, revitalizes, moisturises, natural astringent, antioxidant, helps in removing fine lines and wrinkles. 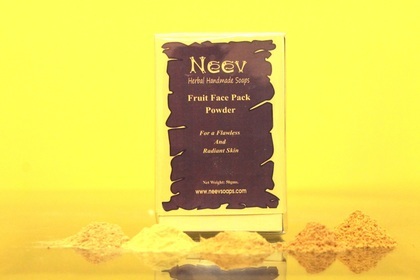 Ingredients : Pure Distilled water of Organically grown Indian Wild Roses from Neev's own garden. Benefits : Great Cleanser and skin toner. Aids in removing oil and dirt accumulated in clogged pores. Ingredients : Distilled water of organic roses grown in Hurlung village by Neev, Rose oil.